It is profoundly mysterious of course, and the mystery begins with the that expression, 'the Word'. We might say that Christ is part of the eloquence of God. The ‘eloquence of God’: what a wonderful phrase, coined by Peter, to bring fresh life to an ancient article of faith. And how appropriate to recall it now when we are gathered here to celebrate his requiem—Peter, who was so constantly here in this Chapel eloquent about God. And eloquent, not only about God, but about so many other aspects of life, chiefly literary and artistic, in the wider context of this College and this University. It will fall to others more qualified than I to pay tribute to Peter’s achievements as scholar, teacher and poet. Many such tributes have already begun to come in. In this Requiem homily I shall speak of Peter as friend, Jesuit and priest, eloquent about God. The first sight of Peter, over fifty five years ago, was not, as I recollect, all that promising of friendship to come. He had arrived at the novitiate early on the day appointed for entry after the long train journey from Perth. The rest of us had put off our arrival until the last moment, leaving Peter to a wearisome wait for companionship the whole day long. He had then, and—I think even his close friends would agree—retained throughout his life, a capacity to give a fixed look, the kind of look that a sergeant major would have found very useful on parade. It took some time for us, equally though less eloquently confused about it all, to grasp what a remarkable and lovable companion had come to us from Perth. ‘In the beginning was the Word. And the Word became flesh and pitched his tent among us, and we saw his glory, full of grace and truth’ (John 1:1, 14). In the second-last conversation I had with Peter, we agreed that that text should be the Gospel for his Requiem. In the halting words of our last conversation, he reiterated that it was very much the right choice. There is a sense, I’m sure, in which every poem that Peter wrote was an instance of the Word becoming flesh. Our Irish novice master, Ned Riordan, whom Peter loved and admired as much for his wit and intelligence as for his holiness, once made a throw-away remark that greatly intrigued him: ‘Where most people look out a window and see a cow, a saint sees a creature’. Peter looked out at the world and acquired from his voracious reading an incredible knowledge of anecdotes and facts—quaint, technical, arcane—most of them remote from anything overtly religious or theological, and found in them a spark of the divine glory. Peter, who was never a good sleeper, certainly set his heart to rise early. And it was as an early riser that he would meet those other early risers and workers: the janitors, porters, and cleaners of the buildings where he worked. And he greeted them not as a busy academic rushing past on his way to higher things, but as a fellow human being, going to his labour as they were busy about theirs. The unfailing courtesy, the witty and cheering word that won their respect and affection flowed from his profound humility, his sense of being thrown into the mix of humanity and standing in as much need of God’s grace and succour as anyone—he, who had so little to be modest about. If he was much loved, as well as respected as Provincial, it was because he met everyone on this simple human level. No one in the Province, no matter how far below him in education, ever felt the weight of his words or put down by his learning. What a blessing for us to have a Provincial who could sit alongside us in our humanity and use his great intelligence, wisdom and articulacy, simply to help us name and so render more manageable our hopes, our fears, our sorrows and our aspirations. A man fearlessly immersed in the university world and the contest of ideas, Peter never ceased to point and provoke us to be similarly outward-looking to the world. He often appealed to another Johannine text: “God so loved the world …” (3:16) and stressed that the world that God so loved—and gave his Son for its life—was not some sanitised or past world but the present world in all its squalor, violence and meanness, as well as its beauty, decency and love. Peter was ordained a priest in Perth on 12 December, 1970, the same day as five others of us were ordained here in Melbourne. In preparation for that event we had been sent off to the Carmelite Sisters at Kew to be measured for albs according to our various bodily proportions. No less than 41 years later when concelebrating with Peter a Mass for the Golden Jubilee of his devoted friend Sr Margaret Manion and my own Loreto Sister, I was startled to see Peter putting on exactly the same alb. Alas, it was not the garment that once it was, nor by now was Peter the slim ordinand that once he was; the strain upon zips and stitches all too clearly showing a growth in stature as well as wisdom before the Lord. But the fact that Peter still wore that alb—besides being a tribute to the needlework of those good sisters many years before—said something the kind of priest he felt he had been ordained to be. the cultic side of priesthood, which still is mainly the Eucharist, is what sort of besots me the older I get. The word ‘Eucharist’ means saying ‘Thank you’. I think that God can never be thanked enough for being God and for sending his Son Jesus to be both God and a human being. There is no end to the amount of celebration which this warrants. If the Incarnation—the Word become flesh—was the central truth of the Christian faith for Peter, he also celebrated in countless poems and sermons the joy and splendour of the Resurrection. He was ever conscious, however, that the path from Incarnation to Resurrection led through the divine vulnerability that climaxed at the cross. If Peter was a kind and compassionate priest, a faithful and sympathetic friend, it was so because he had personally plumbed and felt the brunt of human alienation and despair. He was no stranger to depression, could swiftly oscillate in mood between high and low. For Peter the supreme moment of divine eloquence occurred at Calvary—an hour when the divine Son uttered very little but was stretched out, nailed and lifted from the earth in a helplessness of love eloquent beyond discourse of any kind. His 1986 poem Crux speaks so typically of Peter before that divine humility that I cannot forbear reading it now. Is all we give you still. As he lay dying in Caritas last week, I asked him whether he remembered that poem. ‘Indeed I do’, he said. He was living—or rather, dying—it now. As long as I’ve known him Peter has always lived in close consciousness of mortality. In the college library where we did our early studies in Philosophy there weren’t many books that were not in Latin. But Peter found his way to a treatise of Karl Rahner on Death and it left a mark upon his imagination and his writing that never went away. Nor was this preoccupation with mortality merely theoretical. I know there are many of you here present who have experienced Peter’s priestly accompaniment through tragedy and loss in a deeply human way. Whether that was in the context of explicit Christian faith or no faith at all, Peter knew what to do and say. I believe it is a condition … let’s call it a room, which is what John Donne called it, which precedes and leads into a capacious and entirely blessed and secure immortality, one of whose names is heaven. And I believe in that very, very strongly. And I probably believe that more strongly than almost anything else. To speak personally, it has always been a great sustenance for my own faith that Peter, who read everything, heard everything that could be thrown against the faith—in the name of so much suffering, so much evil—and who was constantly in conversation with friends and colleagues who did not share his faith, could hold to the end that ‘assurance of things hoped for, the conviction of things not seen’ (Heb 11:1). Peter’s faith was simple in the best sense, his piety unostentatious but profound. When you visited him in his room in the Dome, there was his Breviary open, his vow crucifix close at hand. Many have remarked on the equanimity with which Peter accepted his terminal illness and the medical procedures it increasingly required. The poem Rehearsal is, I believe, his Nunc Dimittis. He addressed it publicly on several occasions in recent months, including what was to be in fact his last class of all, given to our Jesuit students at Jesuit Theological College early in May. Several times, in the course, of that event, granted his physical condition, I tried to bring the session to close but, try my best, he kept on explaining, drawing out responses—the teacher to the end. Farewell, but once again the hint of resurrection. ‘Yesterday’s vow goes on wreathing its way through the heart’. Peter’s vowed life as scholar, teacher, poet, priest, wit and friend has wreathed its way through our hearts—hearts that so keenly feel his loss. His immense legacy, in memory and print, will ensure that his eloquence about God remains. 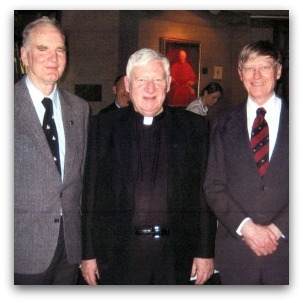 Pictured above: Jesuit contemporaries Andrew Hamilton, Peter Steele and Brendan Byrne, at Newman College. Brendan Byrne teaches New Testament studies at the United Faculty of Theology, Parkville, in Melbourne. Thank you Brendan for your homily which touched me deeply. I did not have the priviledge to meet Peter personally but on the many occasions I visited the Newman oratory when he was presenting and ot responding I appreciated from afar his 'eloquence of God. As I drove home in the rain from the Vigil Mass on Sunday evening I imagined Peter crafting a poem that mirrored the celebration of the Eucharist with glory and thanksgiving. Thank you!